Changing the Default UDP Maximum Size. Last updated March 1st, 2014 by Steven Jordan. 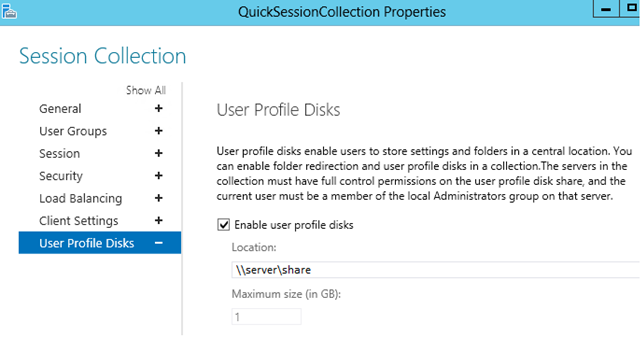 Takeaway: This article explains how to change the default maximum size limit for User Profile Disks (UPD) in the Remote Desktop Services (RDS) Session Collection. Windows 2012 R2 provides User Profile Disks (UPD) to store user profiles on individually assigned VHDX drives. The RDS Session Collection wizard enables UPD and configures the collection's attributes (e.g., network share). Initial configuration for the default UPD maximum size is simple; changing the default maximum size requires some extra work. Background: Exercise caution when configuring the RDS Session Collection UPD maximum size. The UPD maximum size sets the default size for each users' VHDX. I thought 1GB per UPD would be sufficient; if not excessive. After all, most 2008 roaming profiles are around 50MB. I found I misjudged the 1GB maximum after an employee complained of an "out of space" errors. The user's VHDX size limit is insufficient. The individual's VHDX disk requires re-sizing. The default UPD size is insufficient. New profiles (i.e., VHDX) are based on the UPD Maximum Size, located in the RDS Session Collection properties. The Properties GUI allows changes to all UPD attributes; except the maximum size field! The best solution is to plan ahead. Each UPD (i.e.,VHDX) is thin provisioned so it's OK to over-provision. The size of a dynamic VHDX disk equals the size of its encapsulated contents. UPDs provisioned for 100GB will (most likely) use less than 1GB of physical drive space. In addition, Windows 2012 R2 includes improved SMB3 protocols. SMB3 breaks the conventional wisdom regarding user profiles. File transfers using Windows 2008 technology (i.e., SMB2) are lucky to achieve transfer rates of 100Mbps across a 1Gbps switch. In contrast, the same file transfers via SMB3 nearly saturate the 1Gbps ports. SMB3 leaves SMB2 in the dust! Better yet, disks (at least my disks) cannot keep up the data transfers using 10Gbps Infiniband ports. The physical hard drive, not the network, becomes the bottle-neck. The crazy-fast transfers makes it is perfectly OK to to host a large UPD (e.g., 50GB) on a 2012 R2 network share. User profiles are officially antiquated because of SMB3. A) Expand the VHDX from any 2012 R2 Hyper-V server. The Hyper-V Manger simplifies the VHDX expansion with a wizard based Edit Disk tool, located in the Actions menu. B) Extend the NTFS volume on the VHDX. Mount the VHDX to any 2012 R2 server and use the the disk manager to extend the disk. The RDS Session Collection's default maximum size setting cannot change from the GUI. The work around is to simply re-size the default UPD. That's it! The Collection Session properties will not update to reflect the new UPD maximum size. The grayed out size limit will remain inaccurate, however all new UPDs will match the newly expanded VHDX. Does anyone out there know where to change this setting in the registry? If so please post! I am planning on migrating the RDS profile disks to another file server. What is the best way to do this? Hi Dennis. The RDS profile disks are VHDs that can be moved like any other type of file. Our big concern is with service availability during the migration. We have a couple approaches: Disable logins and log off users to prevent profile corruption. You may want to provide RDP access with temporary profiles during the migration. DPM or WSB backups is another approach if you're not worried about real-time changes. Simply restore the backups to the new location. Keep in mind, users may not have the most current file changes if you restore from backups. However, you'd still have the original profile disks (i.e. newest data) to restore from. Moving the RDP profiles is easy. The challenge is finding the solution that works best for your organization. How can i achieve the second actions?